I’m almost done with Monica Seles’s book, Getting a Grip, and a review will be coming later this week. I will say this: I’ve had a very hard time putting it down; it’s that good. Oh boy, can I relate … I think many of us probably can, even if weight or recovery isn’t your challenge, all too often our mental state impedes our ability to make progress or change. How often do we feel this way, feel this struggle between the chicken and the egg — be it weight loss, recovery, winning a game, earning a job, opening a business, finding the man/woman of our dreams … anything really: which comes first, the confidence, or the sensation of confidence that allows us to reach for our goals or our dreams? For so long now, I’ve been struggling with not being at my “ideal” for me. I realize life changes, I’m five years older now, etc., but I hate that I am not able to re-lose the weight I’ve gained. I hate admitting it because it makes me sound vain, but it has damaged my confidence and my sense of self. Not every day, but many days. I’d say I come to terms with the fact that where I am now might be my comfort zone about half the time (it’s maintainable long-term), but the other half of the time, I’m still bummed to know I’m not in my best potential “fighting form,” so to speak (and I could be if I tried harder). (I haven’t stepped on the scale, but I doubt even my new exercise additions (Shred, P90X) are able to combat the emotional eating/mindless eating I’ve engaged in at work or home). As Monica describes in her book, I lack the confidence I once had, and feel like every day I wake up feeling like it’s a “do-over” to make up for the previous day’s indiscretions. And the worst part? It’s not on fun, exciting foods shared with loved ones and/or friends … it’s silly crap I just don’t need, yet continue to buy anyway and eat alone. I’m not spitting it out (ten weeks sober!!) … but this is just as bad because now the calories are ALL ingested. (Yes, I realize the solution is just not to buy said crap … today is a new day and I will make it my goal to not buy anything I didn’t intend to buy). Gaining back some due to my eating errors has often made me feel like a flop, but at the same time, I’m not doing enough to really get back to my ideal, because plain and simply, my head isn’t in the game. At least not as much as it could be. I can’t yearn for the past, but I wish I could channel that old me who really was sparked to change. Some days I’m just sick of thinking about food, calories, points … sick of having to think about it. Yet where would I be without thinking about it? Likely back at my pre-WW starting weight, which certainly wouldn’t be a tragedy … but would definitely not make me happy. Even with knowing how to lose weight and knowing that 90% of weight loss is about eating less, I’m still over-exercising and eating more than I need, which means I’m not losing weight and not feeling any better about myself. Clearly, as they did five years ago, my actions and behaviors need to change before I see changes in my body — literally and in my confidence levels. This isn’t to say I’m wallowing; most days lately I’ve been feeling good. I just have weak, sensitive moments like anyone else. This weekend I had a blast at a wedding with friends and danced my little heart out. I felt confident and thought I looked pretty good in my purple dress Saturday night (got lots of compliments) … but then Sunday I looked at my pics, and noticed quite a few I didn’t like; some were taken at particularly unflattering angles … but some were reality. For a minute, I was right back to feeling like the pre-WW Melissa, disliking what I saw. Fortunately, I snapped out of it quickly, but it was evidence that my mind and body still have a long way to go til they are in harmony. Like Monica, I want to find my ideal and be at peace with it, instead of fighting it, possibly even fighting nature. Instead of eating more than I need, and then over-exercising “to make up for it,” I want to just eat and exercise in moderation. It’s a vicious cycle, and one that won’t breed confidence; this much I know. That said, it’s a hard habit to break. For so many years, I used exercise as a weapon. I say I love working out, and I do, most of the time … there’s nothing like a good sweat session or the post workout high … But some days I honestly just don’t feel like it … and yet my disordered mind still tells me “but you have to go!” And then I go out of guilt, and end up eating more than I needed … hence, the cycle continues. Like Monica, I need a clear head. Coincidentally, this is my “rest” week with P90X (week four) … there are still workouts to complete, but it will be less intense and I plan to take advantage of the break and will loosen up on my usual cardio sessions. I need to reset my hunger queues, and Mondays are a great day for that. The bottom line is, I need to eat less to lose … and not in the restriction sense some of you might be thinking and/or fearing; that doesn’t work. I’m talking about just sticking to a perfectly normal range without adding in unnecessary crap I don’t need. I am still on this journey, so forgive me if I sound depressing today; even when we’re getting better, there are still blips on the radar. In this case, it’s not chewing/spitting, but rather over-exercising and over-eating and I’m coming to grips with the notion that all my hard workouts are for naught when I’m eating like this. That said, I’m learning to live one day at a time … so no regrets for the past. It’s a new day, and a new week. How about you? Which comes first for you? Confidence, or the feeling of confidence? wow lissa, great blog post! 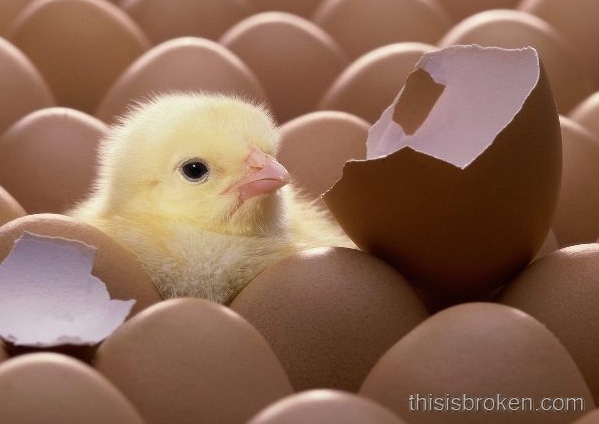 chicken or the egg…trying to figure it out just keeps us in the same cylce, going round and round…trying to decide what to “change” first…how can we actually scramble the egg or fry the chicken if we just keep ruminating over what we’re hungry for?! “Or do we need to “fake it til we make it?”” yup! my counselor told me i need to do this. little changes and efforts eventually become real. sometimes it is all you can do. This is such an interesting train of thought. I always used to say “If I could just magically lose the weight, I KNOW I could maintain it because I’ll be so happy and confident.” Well, it turns out that it’s all been harder than I thought. So many head games, even after losing the weight. What I have realized is that things are just constantly changing with how I define health, how I define beauty, and day to day my confidence can change, with or without the scale. I think there is something to the whole “fake it til you make it” idea. Can’t wait for more book thoughts! I can relate to this post so much only I don’t remember a time when I actually felt good about my body. I do know how to lose the weight and all about the viscous cycles of overeating and over exercising. I have been trying to eat and exercise like a normal person but the weight still sticks around. I am really looking forward to reading the book review. I really, really want to read this book. I’ve heard nothing but good things about it! I think we’re led to believe (by society) that confidence comes with actually feeling like we look good…whether that’s at a certain weight, a new hair cut, or a cute new outfit. But if we all learned to be confident WITHOUT those things, I guess it wouldn’t really matter? Thanks Clare!! Exactly, it still keeps us going in the same cycle. I think the solution IS to fake it til you make it. I soooo know what you mean, Lara. I thought losing weight would be the magic pill, but it didn’t really change my life as much as I thought it would — I created my own monster! Beadie, for my whole life I couldn’t have related to this either, but when I got to my goal weight on WW, I felt hot and invincible, like I’d never felt before. It was not to last; that’s the sad part. So glad you guys are so stoked about my review – it won’t do justice to the book (you have to read it yourself) but I’ll try my best because it was amazing. I finished it at lunch today! Holly, I think you’re right … we’re taught if we look good, we’ll feel good … but really it’s the other way around. If we feel good, we exude it and thereby look better, happier, lighter. Society just messes things up. I have found that my confidence greatly increases when I have even just small amount of success. So in the case of weight loss just losing 2-3 lbs really gets my confidence up and helps me get my head “back in the game” Being at a comfortable weight definitely gives me more confidence, but I know that losing weight and getting to goal does not = happiness in itself or long term confidence. We truly need to find something else within ourselves not related to weight/looks/money/job etc that gives us confidence and makes us happy. I agree, even just a couple days of eating well and exercising moderately make me feel so much better. But it’s not only about that, and that’s where I (and others) get hung up. We’re taught to think those things yield confidence; it’s almost like we’re brainwashed that these are the tools to make you confident, yet it comes from within.